The so-called "toys-to-life" category is about to get an enormous jolt, as Lego and Warner Bros. Interactive have announced their upcoming Lego Dimensions game—and teased it with this entertaining five-minute short starring Batman, Gandalf and Wyldstyle. Toys-to-life was pioneered by games like Activision's Skylanders. You take a collectible figure, place it on a tray, and see it come to life in a video game as a playable character. When Lego Dimensions launches Sept. 27, there will be plenty of popular characters to drop your money on—from DC Comics, The Lord of the Rings, Back to the Future, The Lego Movie and more. 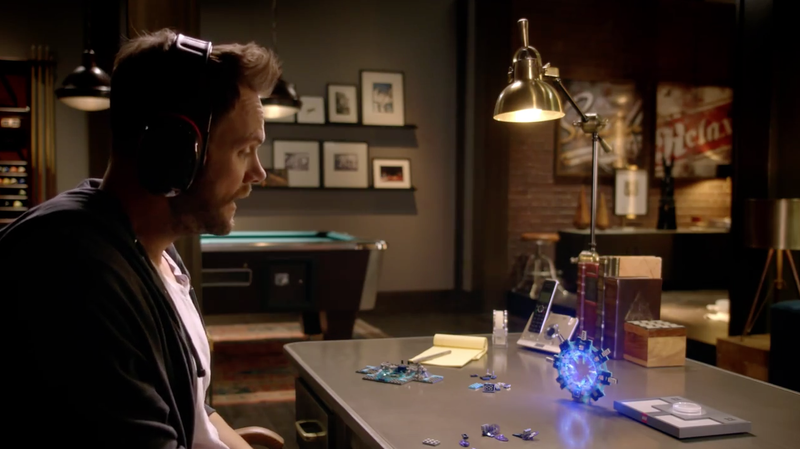 And according to the video below, it might have all started at Joel McHale's house, as he opened a dimensional vortex and suddenly found himself chatting with Batman, Gandalf and Wyldstyle (whom, you'll remember, was Emmet's love interest in The Lego Movie). "Play with different minifigures from different worlds together in one Lego videogame, and use each other's vehicles and gadgets in a way never before possible. Lego Bad Cop driving the DeLorean Time Machine … why not?! The Lego Ninjago Masters of Spinjitsu fighting alongside Wonder Woman … yes, please! Get ready to break the rules, because the only rule with Lego Dimensions is that there are no rules." Now, of course, McHale needs his own Lego minifigure.